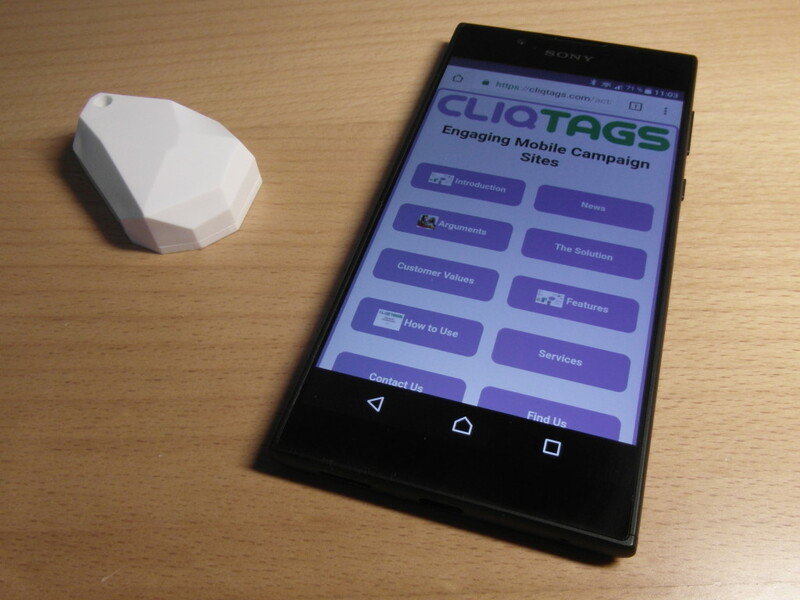 Using beacons with CliqTags is a great and low cost way to provide context/location based information, be it for information and/or interaction, for the moment or over time. With Eddystone-URL it becomes much simpler. What we are talking about is small wireless devices (as seen above) that can be placed wherever it’s relevant to provide information about that physical spot, that continuously send out a short message, that can be detected by mobile devices from a distance (10s of meters). All larger manufacturers of beacons support both iBeacon and Eddystone, sometimes in the same beacons. The flavor of Eddystone that’s immediately interesting for use with CliqTags is Eddystone-URL, that transmits a URL, for navigating to that Web site, via the Physical Web app (soon freely available for iOS and Android). Abiro also offers an Eddystone-URL app for private-branding. If you want to use iBeacon and/or geofencing in combination, we have a solution for that in the shape of CliqTags Spotter, also using CliqTags for the content.